The Iowa Hawkeyes are up a spot to 18th in the latest Associated Press Poll after a 23-0 win over Maryland. 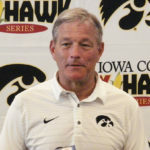 On a day that featured gusts of more than 40 miles per hour Iowa’s pass game took a back seat to a ground attack that churned out 224 yards and a defense that limited the Terps to just 115 total yards and seven first downs. With nearly 41 minutes the Hawkeyes more than doubled Maryland’s time of possession. As for the shutout, it is the 10th in the Ferentz era and the first since a 28-0 win at Illinois in 2016.